...when the user steps away from the station. No timeout period before the system is fully secure, and no need to remember to logoff. ...when the user approaches the system. ...Small sensor (less than 2 square inches) is easily mounted on a monitor. Simply connect to a USB port on your computer. ... Adjust the proximity sensor parameters from directly within the TSL-PRO software. No software drivers to install. See a screenshot of the configuration menu. Anyone who needs to Password Protect access to their workstation or server. TSL-PRO provides a secure password mechanism for NT/W2K/XP/2003 - and runs "transparently", so you can still monitor the programs that are running. This is ideal for:t">System Administrators:control access to single-user or multi-user systems in a corporate environment. Transparent Screen Lock PRO enables IT professionals to prevent unauthorized system access, while maintaining the ability to view applications running on the desktop for monitoring purposes. Transparent Screen Lock PRO delivers system security measures that are essential in today's open-concept corporate offices with free movement of employees and visitors, as well as in high security environments such as financial institutions and banks, hospitals and pharmaceutical research facilities, government offices and military installations. With its ability to limit system access to authorized individuals in both stand-alone and multiple-user shared computer environments, Transparent Screen Lock PRO is ideal for facilities which must ensure compliance to the 21 CFR Part 11 code of federal regulations. With new optional support for a hardware proximity sensor, TSL-PRO delivers maximum security by automatically locking the system when the user steps away from the station. When the user approaches the system, TSL-PRO's password-protected logon screen is automatically displayed. 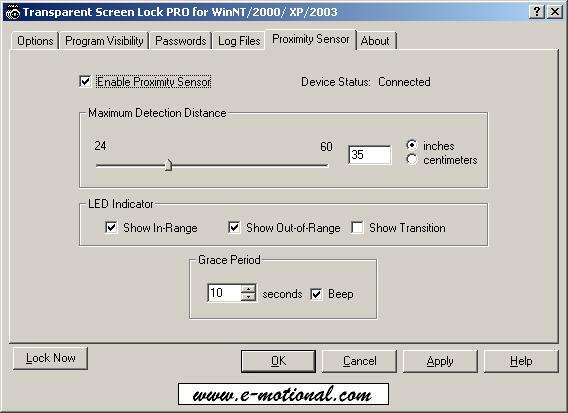 The proximity sensor configuration options are adjusted direclty from within the TSL-PRO software. The TSL-PRO logon screen will automatically be displayed when the user approaches the system. Copyright 2004-2018 Esm Software. All Rights Reserved.